A march by a far-right group has been banned after police said it would have incited violence. The Scottish Defence League planned to demonstrate in Glasgow on Saturday against what they claim is the cover up of child-grooming gangs operating in Scotland. But senior officers objected to the march taking place on the grounds that it “may incite or provoke reaction from the local Muslim community”. Police Scotland voiced their concerns after monitoring exchanges between SDL members on social media. 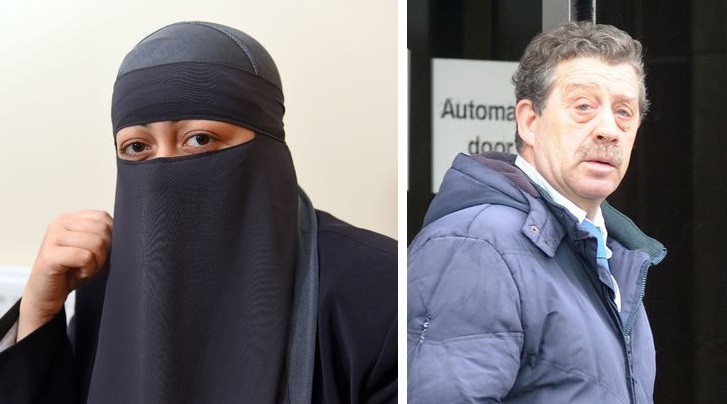 A mum whose religious veil was ripped off her face in the street last night hit out at the sentence handed to the racist who carried out the attack. At Glasgow Sheriff Court yesterday, Sanchez admitted harassing Shirin and acting in a racially aggravated manner towards her in the city last November. Sheriff Alayne Swanson said the offence was “serious enough” for Sanchez to be jailed but instead ordered him to carry out 250 hours of unpaid work in the community. Mother-of-one Shirin, 32, who wears a full-face niqab in public for religious reasons, said last night: “He should have been sent to jail. The fact that he wasn’t sends out the wrong message to people. Racism is something which shouldn’t be tolerated anywhere. “I was left scared to go out with my six-year-old daughter and was living in fear of being attacked again. I was afraid every time I went out that it could happen again – it’s not the way people should have to live. 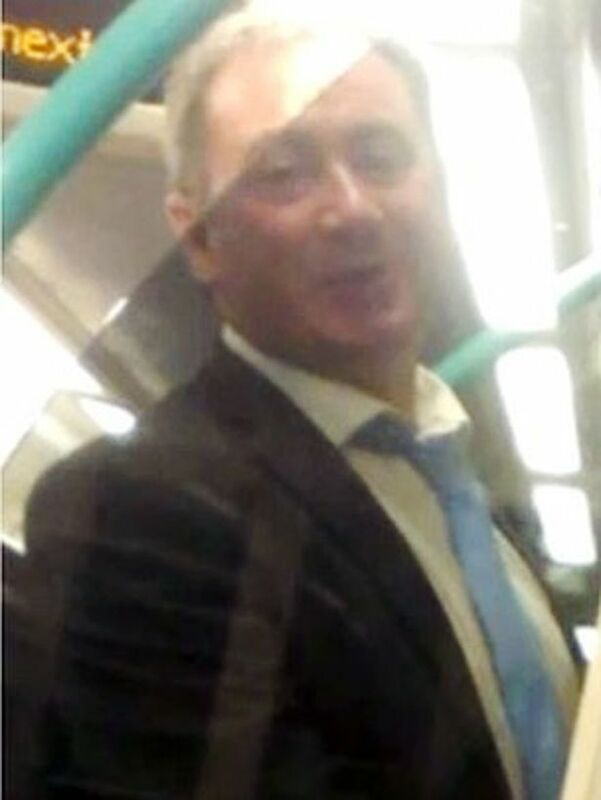 An investment banker was caught on camera launching a racist rant at a woman on an inter-city train in front of shocked passengers. Police issued CCTV stills, and a mobile phone snap of Neil Docherty taken by a disgusted witness, in bid to track him down. Within hours members of the public called cops with his name and place of work, Livingston Sheriff Court heard yesterday, and he later handed himself in to police. Docherty, of Linlithgow, West Lothian, appeared on bail and admitted two racially aggravated offences. He pleaded guilty to assaulting Fella Hammach, 33, on board a Glasgow Queen Street to Edinburgh train at Linithgow, West Lothian, on August 28. The 43-year-old also pleaded guilty to acting in a racially aggravated manner which caused or was intended to cause alarm and distress to Ms Hammach by shouting and swearing, acting in an aggressive manner and directing religious remarks towards her using racially offensive language. Procurator fiscal Catherone Knowles said the assault was witnessed by several passengers on the train, which was packed with revellers returning from a night out. 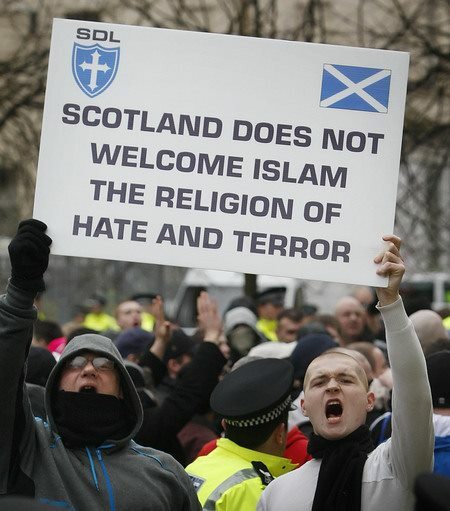 The Scottish Defence League (SDL) is planning to host a large rally in Dundee in “the next few weeks”. Organiser Graham Walker said scores of people are lined up to attend the city-centre demonstration. The controversial group have held rallies in Dundee before that have been countered by members of Unite Against Fascism (UAF). 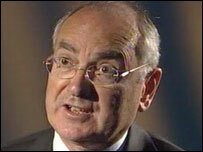 It has branded the SDL – and its sister organisation, the English Defence League – as racist. 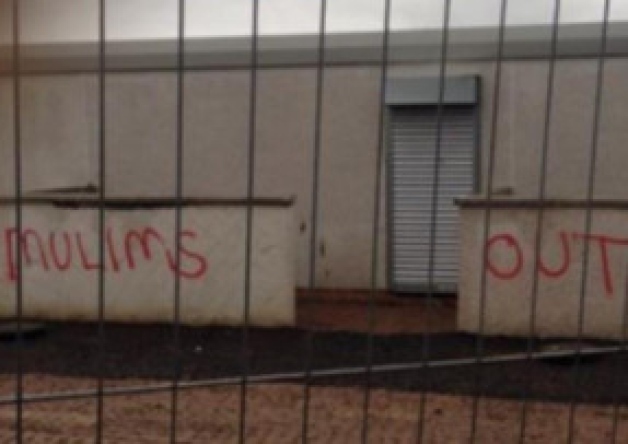 Police are hunting a man who spray-painted anti-Muslim graffiti at several locations in Livingston. The racist slogans were sprayed in the Dedridge area of the West Lothian town from 02:00 on Saturday morning. Police Scotland said the suspect may have been wearing yellow “marigold” gloves. He was described as white and wearing a black baseball cap with ear flaps, and a red, white and blue striped football scarf wrapped round his face. He had a dark coloured zip-up jacket, jeans and black boots. He is thought to have used a large white tin of red spray paint. The brother of David Haines, the British hostage murdered by Islamic State militants, said he does not blame Islam for the killing. “I have become aware of a number of verses in the Koran that I feel particularly apt at this time,” Mike Haines told reporters. A man who launched into a racist tirade outside a Scottish mosque the morning after drummer Lee Rigby was hacked to death in London has escaped with a £150 fine. Grant Gallagher caused a disturbance outside the mosque in Livingston, West Lothian. He was heard shouting: “The soldier was innocent. He didn’t deserve to die – you terrorists killed him.” He angrily grabbed the gate with both hands and shook it, screaming racist abuse. Livingston Sheriff Court heard that an Asian man who witnessed the bizarre behaviour stopped his car and wound down the window. A woman having a cigarette in her garden nearby also heard Gallagher’s 2am rant. They were so concerned that police were summoned. Gallagher was detained and arrested some time later. He made no reply to caution and charge. Gallagher, 55, of Lime Grove, Livingston, pled guilty to behaving in a threatening and abusive manner on May 26 last year. He admitted shouting and swearing and making racist remarks during the incident, classed as a racially aggravated offence. A leading intelligence expert fears Islamic extremists are deliberately threatening to behead a Scots aid worker to break up the UK. David Haines was paraded by Islamic State fighters this week following the second beheading of a US journalist. A macabre video makes it clear the 44-year-old faces a brutal death at the hands of an IS executioner. Last night highly-placed intelligence sources revealed it is “extremely likely” ISIS terror chiefs believe beheading Haines will make Prime Minister David Cameron appear “weak”, fuelling anti-British sentiment among referendum voters. One expert believes they are using the dad-of-two in a propaganda drive as the Scottish independence referendum approaches. Professor Anthony Glees, one of the UK’s most respected intelligence analysts, is convinced ISIS sense an opportunity to weaken the UK via their brutal campaign of terror. A young man who sent an email threatening to burn an Edinburgh mosque ‘to the ground’ has been fined and told to read up on history by a sheriff. Andrew Steele, 21, sent the message to an office manager at the Scottish Parliament in the wake of the murder of soldier Lee Rigby. It referred to a meeting of the Unite Against Facism movement at Edinburgh’s Central Mosque and included a comment of his that it should be ‘burned to the f****** ground’. Fiscal Depute, Arlene Shaw, told the sheriff court that the email showed a screenshot photo of a Scottish Defence League Facebook page which contained several threats in relation to the meeting at the mosque the following day including his comment. Unite Against Fascism (UAF) extends it’s solidarity with all those who are subject to threats, intimidation and Islamophobia, from the publicity hungry, fascist sect, Britain First (BF). The group say they plan to travel around Britain to promote their poison. This follows from when on May 10/11th, BF subjected mosque goers to an ‘invasion’, where Bibles were thrust into Muslims’ hands. This was intimidation, and as ugly as BF’s politics. Many were bewildered by BF members who went on to holler insults and behave menacingly. UAF has been contacted by several people who had their place of worship threatened by these thugs. All told a similar story of how worshippers were left shaken by this unwarranted attempt to put fear into Muslim people. This is totally unacceptable. Were such behaviour to happen at churches or synagogues, there would be rightly be a public outcry. So there should be, here. At Glasgow Central Mosque and at Cumbernauld Mosque, to their great credit, it was Muslims who calmed the BF thugs down! BF are also, as Hitler did, telling big lies about their popularity. They claim to have had over 500,000 Likes on Social Media. The reality is rather different. Using a series of ‘patriotic’ images, not immediately linked to BF, they have amassed fake popularity behind such fake postings. Their membership is barely 100, far away from their claims.